Xiaomi's upcoming Redmi Note has appeared in a midnight teaser confirming its existence. Details on the Xiaomi Redmi Note have been slowly leaking with a midnight teaser confirming the device and its specifications. The upcoming smartphone will sport a 720p resolution, 5.5-inch screen and an octa-core processor. Previous rumours also suggest that it will have 3G network capabilities and 1GB RAM. Rumors about the successor to the Redmi instantly spread when Xiaomi had a new smartphone approved by the Chinese government network regulator Tenaa. Xiaomi recently sold an estimated 5,000 units of the first Redmi in eight minutes in Singapore and the most popular Chinese smartphone maker is expecting the second Redmi will achieve the same success. The 'Note' in the title suggests that the upcoming device could come with a stylus – we'll have to wait and see. The price of the new Redmi may be somewhere between of $100 to $250. 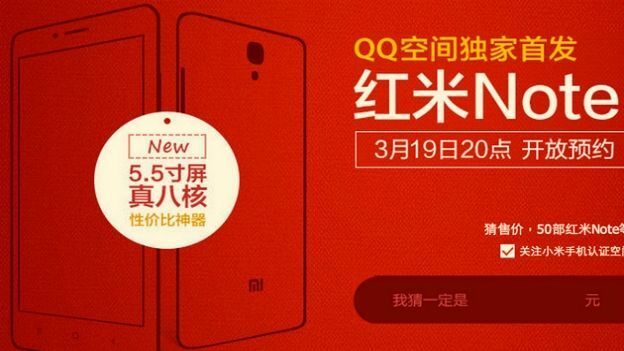 The Xiaomi Redmi Note will be able to pre-order in China at 8pm local time on March 19 whilst everyone else will have to wait until it crops up online. Stay tuned as T3 will keep you posted on any updates.